You are invited to share in Art Attack’s holiday tradition! Festivities begin with a tree lighting, followed by the Choir of Sound, wandering carolers and as always, our dazzling array of industrial, contemporary visual and performing arts/artists at over 40 locations. Jump aboard the FREE Art Ride to check out our west end locations such as studio e, SANCA and Equinox Studios for live demonstrations, open studios, bonfires, music and fun! All City Coffee Clown Riot: A look back at the senseless brutality that took over the world during the clown riots of 1997. All new works by Edward Matlock. Krab Jab Studios is exhibiting presents Bird Life: The Art of Socar Myles. Known for her highly detailed and tiny pen & ink drawings, Socar Myles releases her newest series, this time revolving around her relationship with the urban avian, from the common pigeon to the soaring eagle. Opening December 12th, 6 – 9 pm, Artist Talk @7:30 pm. studio e features fine art and locally made goods on Saturday 12/12 from 11:00-7:00 and Sunday 12/13 11:00-7:00. Featured artists include; Carole D’Inverno, Sue Danielson, Brian Beck, Jon BDove, Robert Hardgrave and Rachel Illingworth. Open Studios; Blk Pine Workshop, Bremelo Press, F A R I S, fruitsuper design, Jessalin Beutler, KriKri Studio, Iacoli & McAllister, Mavro Tawny, Piano Nobile, Pine and Boon, Rachel Ravitch, Small Craft Studio, TA+MA, and The Pursuits of Happiness. Machine House Brewery continues a Street Photography Exhibition by Steven Sutterby: Atlantic Separation. Through a series or classic black and white street photographs Steven explores the subtle differences of street life 4781 miles apart. Eight and Sand presents 78 Tarot Nautical Group Show with Becca Turner, Mary Layton, Brenda Lyons, Carla Morrow, Carrie Hawks, Deanna Davoli, Ellen Million Graphics, Ellen Wilberg, Helena Reis, Jessica Douglas, Meredith Dillman, Monika Ptok-Byard, Stefania Fanhir Russo, Stephanie Law, Tanya Ross, Tara Fly, Tiffany Toland-Scott and Alexandria Sandlin. The 78 Tarot Project is the first exhibit of a group of international artists that have come together to create several tarot decks, featuring a handful of original works and prints. Spectrum House Salon & Photography final exhibit will be Salt of the Sea by Claudio Duran. Acrylic on wood as well as sumi ink on paper, Claudio’s artwork is inspired by organic shapes, unexpected color combinations, machinery, nature and wildlife, anime, rust and decay, surrealism, fantasy, junkyards and many Pacific Northwest artists. 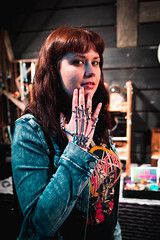 Georgetown Atelier is exhibiting the beautiful work of the hardworking students during the December Art Attack! The students and the instructor, Tenaya Sims, will be happy to tell you more about this apprenticeship-style school and show you around the rustic and inspiring studio in the Old Rainier Brewery. 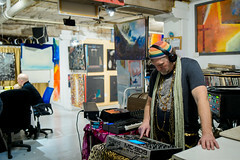 Praxis Arts presents Mike Kline. A pictorial vocabulary of art, simple scenes symbolizing various aspects of the human experience on wood through a range of manipulations such as burning, sanding, drilling and sanding.Equinox Studios The doors will be open for another amazing “Very Open House” and it’s going to be epic! With almost 100 resident artists, artisans, countless guest artists, music, poetry, dance, demos, food trucks and a whole lot more you don’t want to miss! the hammie salon is featuring paintings by Julie Karpodines. This work is a selection of pieces that were made after graduating with her MFA from New York Studio School and was a personal journey into the process of oil painting, using images from memories and remembered places onto canvas. Julie Karpodines currently lives and paints in Spain. Interstitial presents FLOW(FLOCK(surface(FLAVOR)))by Norwegian based artist, Richard Alexandersson. This single video installation traces the complex relationship between material reality and the immaterial substance of CGI animation technology. FLOW(FLOCK(surface(FLAVOR))) plays out as a slow moving study of surfaces. Scale is diminished, texture amplified. Fragmented words, immortalized greenery, traces from other timeframes-these elements held together by impossibly superfluous tape and glue. Exhibit runs thru December 19th. Miller School of Art “Dance, Drink and Draw!”Come dance and draw at The Miller School of Art! Professional dancers will be on hand to dance with you while the public draws and paints the dancers in motion! Then switch places and try the drawing and painting yourself while you watch others take to the floor. Wonderful variety of refreshments provided. Only $20 buys you a front row seat at the easel and refreshments. 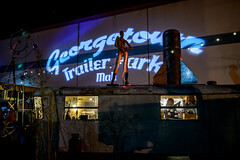 Georgetown Trailer Park Mall offers independent artists, designers, makers and collectors to sell their goods direct in a one-of-a-kind environment thriving with community. Come see us for handmade, up-cycled, and reused products all while hanging in a special, unique little corner of the world! Open for Art Attack until 9pm. Mainframe Shop Movement in Kind: New works by Matthew Whitney Matthew Whitney’s exhibit of new works follow several one-person and group exhibits this Fall from the Boston Center of the Arts to 4Culture in Seattle. Whitney’s work is comprised of personal cartographies: combining smartphone GPS tracking apps with traditional drawing mediums, representing everyday walks. Artist reception 6-9pm, Saturday, December 12. 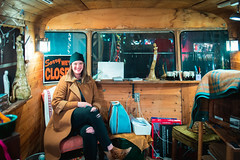 Zippy’s Winter Wonderland: A marvel of an art show right in time for Christmas, Andrew Schons’ Winter Wonderland will be up at the Georgetown Zippy’s Giant Burgers for the entirety of the month of December. The show will be part installation, part art gallery, and will feature primarily acrylic pieces & prints. Be there or be square.